For many petitioners, filing Chapter 7 bankruptcy represents a fresh start. In exchange for relinquishing assets that are not exempt or protected from liquidation, Chapter 7 petitioners receive a discharge, which releases them from further obligation to pay eligible debts. The discharge applies, even if creditors receive little or nothing from the liquidation process -- that is, the sale of assets to generate cash. For debtors with more disposable income, filing under Chapter 13 enables them to reorganize their debts, which often enables them to keep their homes. With Chapter 13, debtor and creditors arrange a schedule of monthly payments to settle the debtor's financial obligations. Under Chapter 13, debtors often pay less than the total debt amount owed, rather than a complete discharge. Chapter 7 bankruptcy does not mean the petitioner loses everything. The trustee evaluates the petitioner's financial circumstances as well as state law to determine which assets will be exempt, or protected from liquidation. The federal government has established a list of exemptions; several states have their own exemption lists. The petitioner may choose to follow whichever list works to her best advantage, however, if she follows the federal list, she cannot choose state exemptions that are not included on the federal list, and vice versa. Common exemptions include a personal vehicle, a primary residence, household furnishings and personal effects. If you own your home outright, foreclosure is not an issue. However, depending on the laws of your state and the value of your home, your home may or may not be exempt from liquidation. Bankruptcy divides your debt into two categories: secured and unsecured. Unsecured debt is debt that is not guaranteed by collateral. Most credit card and other consumer debt is unsecured. Secured debt is debt that is guaranteed by collateral, such as a mortgage, for which the collateral is the home itself. Secured debts receive priority during bankruptcy, along with income tax obligations and child support payments. Priority claims are paid before any unsecured creditors are paid. However, because many Chapter 7 petitioners have few or no nonexempt assets, creditors often receive far less than they are owed before a discharge is granted, and sometimes receive nothing. 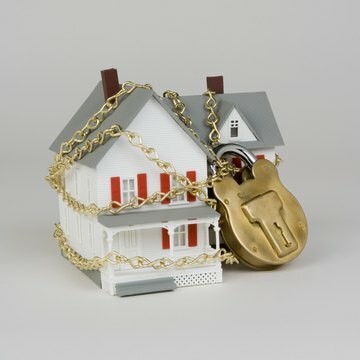 However, discharge does not eliminate liens against secured debts, which means that you may still lose your home to foreclosure even after receiving a discharge for the mortgage. If you have little or no equity in your home, the trustee may abandon it, or exclude it from the liquidation process, because the proceeds from selling it would probably produce nothing to pay to creditors. On the other hand, if the equity in your home is sufficient to provide creditors with some payment, the trustee may include it in the liquidation process. If you are current on your mortgage payments, you may opt to reaffirm the mortgage, which means that you are still responsible for the debt and must continue to make payments or risk foreclosure. Reaffirmation often allows you to keep your home; however, some mortgage lenders will allow you to keep up your house payments and remain in your home, even without reaffirmation.